Labels peel easily from the backing sheet. Easy Peel features expose label edges to speed up the labelling process. Brighter white labels for sharper print quality are perfect for creating professional-looking mailings, shipping, bar coding and organizing. Jam-free and smudge-free. Avery offers many easy-to-use templates for Microsoft Word and other popular software programmes. 8-1/2" x 11" sheets. 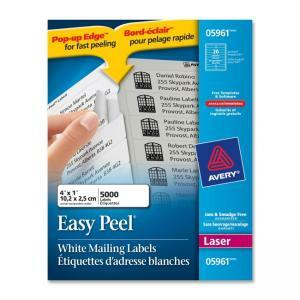 Compatible with Avery Quick Peel Automatic Label Peeler.